OnePlus is gearing up to launch its new flagship smartphone in the next few months. Ahead of the launch, more and more details about the so-called OnePlus 7 have surfaced online. We're already pretty sure the new handset will have an all-screen design, like the Samsung Galaxy A80 launched yesterday, as well as a triple-camera. However, the latest leaked OnePlus 7 image reveals the device with a curved glass display. This dual-curved approach, which allows the manufacturer to squeeze a larger screen into a body that remains narrow enough to comfortably use one-handed, has long been a trademark of the Samsung Galaxy S series, although it was dropped from the Galaxy S10e earlier this year to make it more cost effective. Huawei has also started to use the screen design, most recently with the P30 Pro. Like the Samsung Galaxy S10, OnePlus 7 looks set to use its curvaceous display to increase the size the amount of screen real estate without dramatically expanding the physical footprint of the smartphone. More precisely, we're expecting to a 6.67-inch OLED display – a significant step-up from the 6.41 panel on the OnePlus 6T. The latest leak comes courtesy of Chinese social network Weibo. The photo shows the curved glass display, as well as the eradication of the notch, which OnePlus introduced with the OnePlus 6 in May 2018 and then significantly shrunk with the OnePlus 6T some six months later. As such, it makes sense that we'd seen the design quirk dropped with the OnePlus 7 in favour of an all-screen design. It looks like OnePlus will embed the ambient light and proximity sensors into the screen, while the speaker grill will be relocated to the border of the smartphone. 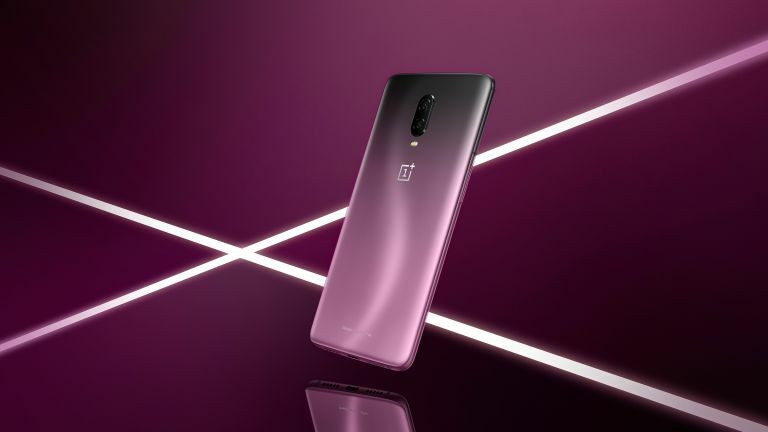 As for the front-facing camera, that looks set to be stored in a small drawer than rises up from the chassis of the OnePlus 7. A second leaked image shared by the same Weibo account claims to show the all-important "About" page in the settings of the OnePlus 7. However, we're a little dubious about this one ... not least because the "About" page of the OnePlus 7 seems to be illustrated by an image of a OnePlus 6T. Granted, that could be because the design hasn't been finalised quite yet and OnePlus hasn't created the renders needed for software pages like this. If that's the case and the second Weibo leak is genuine, we can ascertain some very interesting tidbits about the forthcoming flagship. The leaked image claims the next-generation OnePlus will ship with 8GB of RAM, coupled with 256GB of built-in storage. Powering the OnePlus 7 will be a top-of-the-line Qualcomm Snapdragon 855 system-on-a-chip – a detail that OnePlus has already confirmed along with the fact that it won't support wireless charging. According to the leaked "About" page, the rear-mounted camera will consist of 48MP, 16MP and 8MP sensors. Sadly, there's no word on the selfie camera. As always, it's worth taking these leaks with a sizeable pinch of salt. However, as the OnePlus 7 release date approaches, expect to see more of these leaks and the rumours start to firm.